When Ars Technica reported that they found new Google logo hiding within the Chrome Beta for Android browser last month, we all expected the changes that under going within Google Design Team. Today the Google launch its first official re-invent logo and its showing in their public official domain – google.com. This is the first time Google has redesigned its logo since 2010 when colors were brightened and shading was partially removed. With the new logo, the colors are muted just a bit and it appears to be more flat. The changes are extremely subtle. 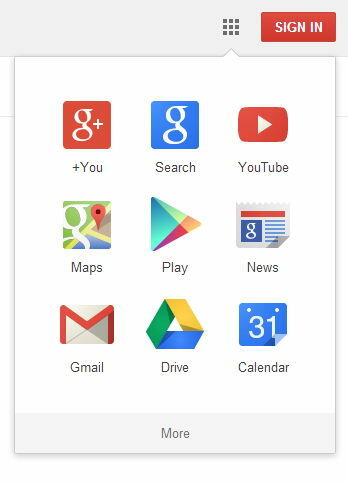 An even more simplistic (fit to the concept of flat) User Interface are introduce with a easy one click to navigate all Google Products. With all the big brand logo re-design such as Ebay, Microsoft and Yahoo, i think Google do not want to get left behind with the re-design frenzy. On their new logo, nothing much changes except they removed the ’emboss’ in letters which Yahoo new logo also had in their recently designed new Yahoo logo. Seem like Google Design Team notice the similarity in design style and decided to change it, Yahoo is in fact one of their closest rivalry you may say.